I am not surprised by this week's ousting of yet another Prime Minister in Australia - the fading glory of the ultra-conservatives lashing out was all too predictable. However it comes at a time when clear and focused policies need to be put in place to save not only Australia, but humanity. We are at a tipping point - actually two, one good, one bad. The bad tipping point is that if we don't do something about climate change we are going to be too late to stave off the worst of its effects. The good is that there has never been a better time to actually do something about it. Solar PV (Photo Voltaic - or the direct conversion of sunlight to electricity) is at an all-time high, generating jobs across the globe. Even better, it generates jobs in rural and regional communities. Battery storage systems are now being deployed at grid-scale for stabilisation and time-shifting of available renewables. Software to be able to directly provide demand-side responses to the cleanliness of the grid are now becoming available. All of these together, along with wind and hydro, are coming at prices that undercut fossil fuels and make mincemeat of the arguments of the right that we can't have reliable power without fossil fuels. The South Australian grid-scale battery storage system has already saved that goverment millions of dollars just in grid stabilisation services, besides what it offers in time-shifting of demand for renewables. To the politicians of Australia, why are you so tightly linked to the fossil economy? What dirt do they have on you that you are scared to go against them? Sure they provide heaps of funds for your election, but aren't you supposed to be governing for all Australians, and not just those with deep pockets (and deeper holes in the ground)? Surely even you can see that renewables provides better jobs growth than mining, and the related jobs in IT and tech to fine tune and realise the fullest potential are just off the scale when comparing to mining - which is becoming more and more automated, meaning less and less jobs. Some of the biggest users of electricty on the globe are moving rapidly away from fossil fuels, many with idealism, but mostly because of pragmatism - it is far cheaper and it is easier to create meaningful change in emissions in the energy market. How is it that you've missed the boat on that? There are 3 states in the US actively pursuing virtual grid-scale batteries (similar to the proposal that South Australia had before the change of government) while there are at least 5 others lining up behind them to see how they go. And I'm not talking small states here - I'm talking about some of the largest economies in the US. All of the top US tech and retail giants have moved to or are moving to 100% renewable energy, and many are demanding it in their supply chain. Yet here in Australia we still think that burning dead dinosaurs is the future. It isn't. It isn't even the present. It is the past. Get over it. Catch up with what the state of the art is - and it isn't that oxymoron "clean coal". I'm currently working with some fantastic people whose software can virtually eliminate carbon from the grid based on modifying demand. It is exciting to see that some of the biggest electricity users, and grid operators, are looking at this to enable their future. Yet in Australia our politicians don't even give a damn about farmers going bankrupt due to drought, because if they are bankrupt they can't bankroll your election fund. To the voters of Australia - demand your right to a livable planet, if not for you, for the next generation. Knock on your local member's door and demand that they stop pandering to coal and start doing the right thing. Our Saeco Talea Giro Plus automatic coffee machine bit the dust a year or so ago, at Christmas, while we had guests - so it hasn't been popular. I'd replaced the power board as it kept blowing fuses, but that again did so - so it was stuck in a corner in pieces as I contemplated my options. The other night I got to work and managed to get the beasty working again. Primarily it just didn't like the over voltage situation here that we finally got sorted out when it was causing random shutdowns on our solar inverter. Parts for a power tool battery charger arrived, only to find that I'd ordered the wrong case style, in both cases. Firstly I ended up with a 3225 (1210) style SMD resistor instead of a 3216 (1206), and they were tightly squeezed so the extra few millimetres meant that they'd be on top of each other. In a similar vein I ordered a MOSFET with a TO-263 case (D2PAK) instead of a TO-252 (DPAK) case. I could probably have gotten away with that one as the better heat transfer would have worked in my favour, except that it would cover the screw hole for the associated heat sink - meaning I'd need to do board mods to get it to fit - which I wasn't really up to and the bloke I was fixing it for is overseas at the moment, so time isn't an issue. I've also got parts on order for an inverter that we use in the car to power my laptop. It has been sitting in a box for almost a decade and died when I tried to use it to power a fluorescent light fitting - even though it was well within the wattage, I'm guessing the startup current and power factor was enough to kill it. It didn't blow the fuse, but it does seem to have taken out the primary MOSFETs. Everything else looks OK, so hopefully it will be a simple job once the parts are here. For many years (decades even) I've been building my own electronic gadgets and fixing the occasional electronic device. Just recently a power supply for our main computer gave up the ghost, and that was one thing I'd never even tried fixing before. Partly this is due to the inherent danger of a switch-mode power supply, where there are quite a few components at lethal voltages - and that is the section that quite often breaks. Partly it is because I haven't really looked into the design of such devices. With the colder months there is less time for doing work outside, so I thought it would be good to upgrade my skills and to invest in some tools and equipment that would make the job safer and easier. I've had a decent DSO (Digital Storage Oscilloscope) for a while, so the only major piece of equipment I needed was an isolation transformer. I've also got on order a nifty little component tester that should make checking those problematic electrolytics a lot easier. So, over the weekend I cleaned up my desk and moved stuff around to try and get an ergonomic workspace that meant I wasn't dragging cables across the desk during soldering or desoldering or other testing. I'm reasonably pleased with the result. So far I've manged to fix my Samsung S7 Edge that I ran over with a tractor, and a solar fence energizer that had stopped working. There are a number of items (including the power supply) waiting for parts, and a seemingly endless list of devices that need poking at. I guess my winter nights are sorted for the foreseeable future. With the rollout of the NBN Satellite service underway it is perhaps unsurprising that the cracks in the system are starting to show, at least to those of us who have not been blindsided by the spin provided by governments of both persuasions. The satellite service is already not living up to its promise, with plenty of chat on social media about the slowness and the flakiness of the service. This was all easy to predict as I've previously discussed, but what is of more concern is the use of "price signals" to manage the abysmal planning failures. Currently if you want more than 75GB in a month, then you have to look at options other than satellite. Sure, you can get generous "off peak" allowances, but since when is the 6 hours between 1am and 7am a viable time for utilising that extra data? Are kids expected to do their homework in that timeslot? Are businesses expected to do their admin, that is increasingly internet-based, during that time? So, for around $115 or so you can get 50 usable GB (i.e. in a time that you are likely to be able to utilise it) on a satellite plan. Heaps, right? Not according to ABS. In December 2015, roughly 13 million subscribers downloaded over 1.7 exabytes, or an average of around 140GB per subscriber per month. Looking at those figures will also reveal that data downloads have been doubling on a per-subscriber basis every 18 months or so. This is as a result of the increase in rich media, social media, collaboration tools and simply the fact that as more people are on the internet, they are engaging more with others. Business is carried out over the internet more. Shopping over the internet is on an upward spiral. Interacting with government is increasingly via the internet. Schooling is making increasing use of internet. Even the "self-serve" support which used to be text-based tutorials is moving more and more towards video. All of these factors mean that the 75GB limit is a joke, and forcing people to pay more for it is criminal. Speaking of criminal, what about the alternatives? Mobile broadband? Remember the 1000GB per month I mentioned? If you want to get that on any mobile broadband plan you are looking at close to $10,000 per month rather than the $50 or so you'd be asked for on a real service. Yet many of us outside the major population centres have no choice but mobile broadband. The satellite isn't going to get to many areas until 2020, and even when it does we already have evidence it won't cut it. City users are getting the benefits of the doubling of data, with their per-GB pricing dropping drastically to mere cents. Compare that with the over $3 per GB on the higher satellite plans or the $10 per GB on a mobile broadband plans and you can see that the digital divide is still with us, and widening. The NBN, and certainly the government inteference, have exacerbated this situation by having this bizzare idea that people in regional, rural and remote Australia somehow are not going to use the internet as much as their city cousins. With the competition in the agricultural sector there has seen a massive increase in the use of technology to reduce costs and improve efficiency. Yet without decent internet this technology is never going to reach its true potential. 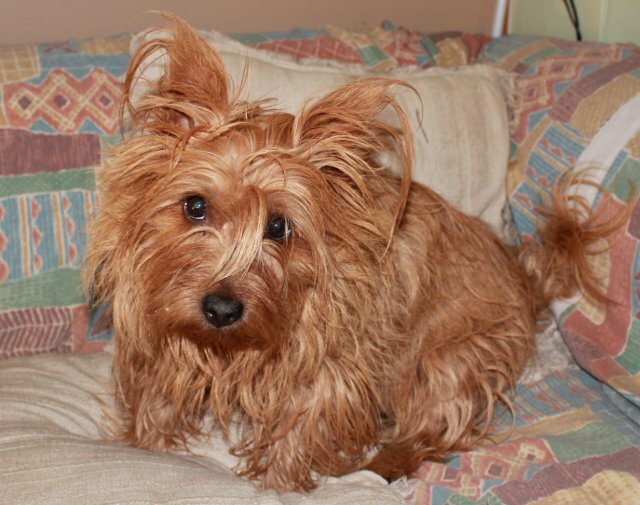 Jedda, my 9 year old Australian Terrier, today lost her "Golden Glow". That was her kennel name when we got her. Born on ANZAC day, she was as tough as they come, but it appears that liver cancer is tougher. Jedda was vivacious, anarchic, over-the-top with a lust for life that sometimes left you speechless - or at least hoarse from yelling at her. She loved nothing more than a long walk, however there was never a walk long enough or with enough new friends, both human and canine, to meet, nor was the car ride short enough to get there. Until proven otherwise, Jedda approached every new person or dog as a potential friend, with her tail wagging and her eyes bright. If proven otherwise, she was a terrier through and through and would take on any dog, no matter how big. She was a challenge at times, headstrong and feisty. We all have bites from trying to do something to her that she didn't like, such as cutting her nails. When meal times came around, or the lead was produced for a walk, she would bounce up and down until the plate was in front of her or the lead on her collar. You always knew she was around at dinner time. At least until last week. The only saving grace was that the progression was quick, and we got a few hours to spend with her at the vet's before she was taken from us, both literally and metaphorically. This blog shows a summary of posts from all Blogs supported by the Saki Site.